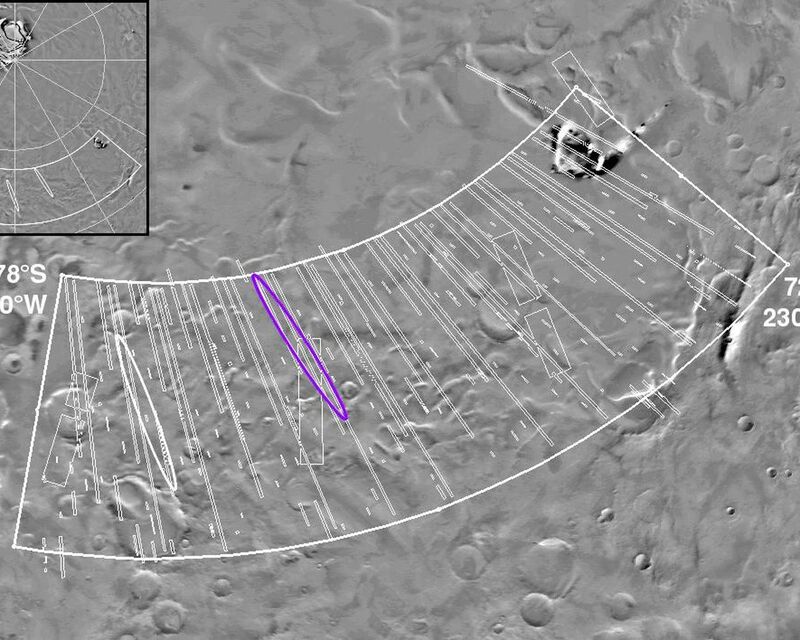 High-resolution views of the Mars Polar Lander landing zone were essential to the selection of a safe place for the December 3, 1999, landing to occur. The Mars Global Surveyor (MGS) Mars Orbiter Camera (MOC) took its first pictures of the landing zone in December 1997 and January 1998. After that time, the south polar region was not accessible to the camera until June 1999, when the south polar winter was ending and the sun began to dawn on this region once again. Since the beginning of June 1999, an intense period of imaging has been conducted over the landing zone so that a safe site could be found. 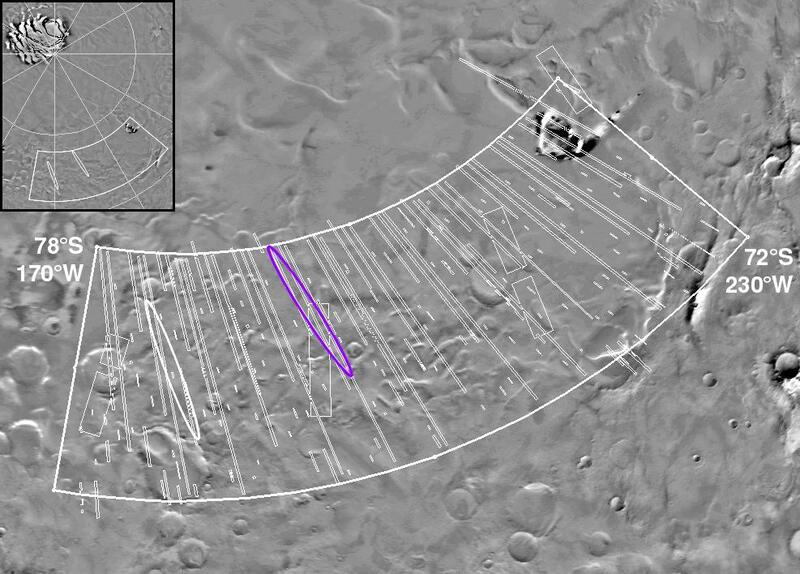 The final site has now been identified, and the pictures shown here give some idea of what the Mars Polar Lander will encounter a little more than three months from now. 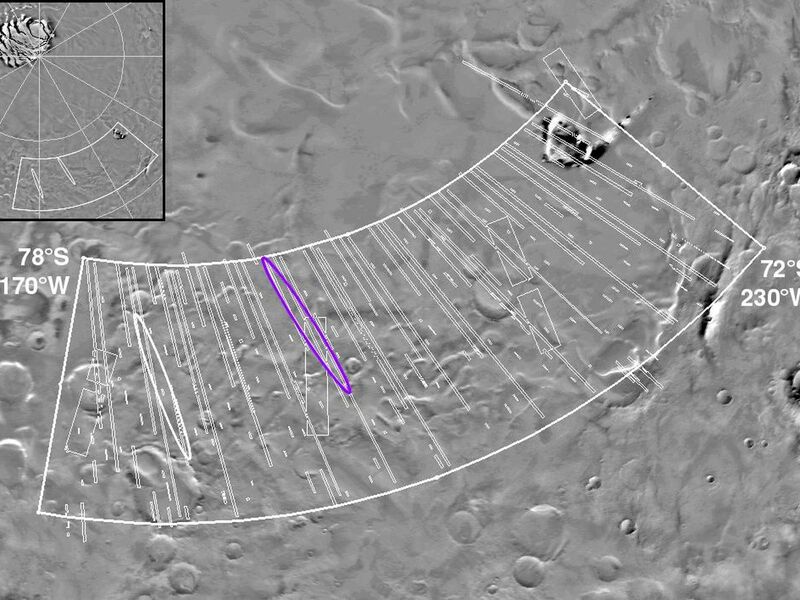 This figure shows the zone originally proposed by the Mars Volatiles and Climate Surveyor (MVACS) science team for the Mars Polar Lander mission, which spanned the region from 72° to 78°S latitude and 170° to 230°W longitude. The thin white boxes and lines crossing the proposed zone outline MOC images taken between the first week in June 1999 and the first week in August 1999. The longest images were taken at 12 by 18 meters (39 by 59 feet) per pixel; there are three sets of long images, each taken during a given week in June as the terminator (the line separating "night" from "day") moved south across the landing zone. Smaller swaths represent images at higher resolution. The best resolution so far achieved is about 4 meters (13 ft) per pixel; better images will be taken in September and October as the sun rises farther and the surface becomes better illuminated. 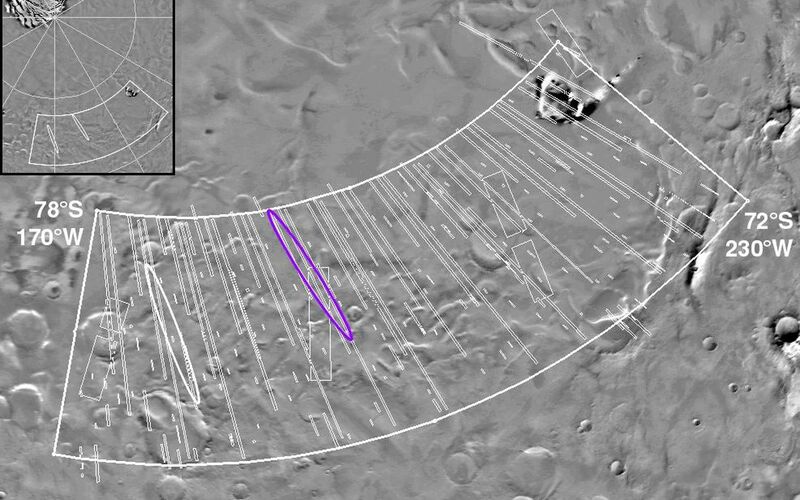 This figure shows the location of the primary (blue) and secondary (white) landing ellipses, which were selected on the basis of interpretation of the MGS data, in particular data from the Mars Orbiter Laser Altimeter and the Mars Orbiter Camera. The selection criteria were to find a place that was relatively flat and relatively smooth, but which displayed characteristics of the south polar layered materials. The inset (upper left) shows the location of the landing zone with respect to the south polar residual (year-round) ice cap. The base map used here is a mosaic of Viking Orbiter images from the U.S. Geological Survey.